Last edited by Mistress_Unknown on Sun Sep 06, 2015 12:27 am, edited 5 times in total. There is none for those who do not answer. Location: Somewere in the shadows, watching you. The main part of the Cirque territory is the Stage, where all performances are held and where the Stage Hands all sleep and gather after shows. Visitors to the Cirque land also stay in here after shows if the weather is bad (though this is up to the Ring Master). 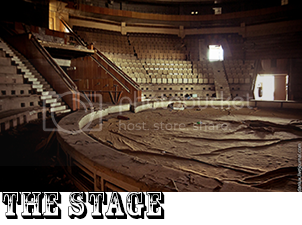 It is a large abandoned auditorium encased in a huge old circus tent that (surprisingly) has stood the test of time with only a few holes and rips. There is no eating in the Stage area and is large enough to hold several dozen wolves. 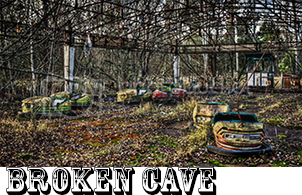 The broken torn down bumper car area has now become what is known as the Broken Cave, a hollowed out skeletal structure over run with weeds and grass. Smaller game like rabbits, squirrels and rodents adore this area for its many hiding spots and grass. This is where Visitors to the territory stay after shows when the weather is good. The Broken Cave has some upper shelter, though more than 75% of the roof is missing or hanging from the rafters. It a regular occurrence for Stage Hands to go through and tear dangerously hanging pieces to prevent injuries. A lack of freshwater sources on the land bridge makes the Silent Lake incredibly important to the Cirque and those who pass through. 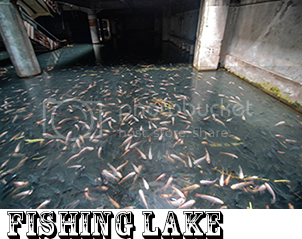 A gathering of rainwater as well as a leaking water tank underneath an old parking garage has created an isolated lake in the territory. 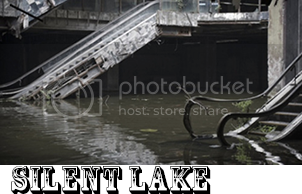 Surrounded on all sides by concrete, the lake cannot be accessed except for the broken metal staircases. Because of the territory’s proximity to the ocean, rainfall keeps this lake from ever becoming dangerously shallow. The more aquatic Performers and Stage Hands stay here between shows. Fishing Lake is actually a part of Silent Lake. Cut off from the rest of the lake by fallen walls, the fish (that where there when the Cirque moved in, so how they got there is a mystery) in this part of the lake have multiplied rapidly in the small area, making it a prime (and easy) spot to get food. It should be noted, however, that the fish in the Fishing Lake have evolved to devour their dead and have become rather.....nippy to unsuspecting paws and tails. It is not recommended that one swims here. Wooden Cave is a peculiar sight (a cave made out of tree wood!). It also is very small compared to Broken Cave. However, it still has a mostly working roof, encouraging those nearby when the weather gets bad to take shelter there until the weather passes. It is very common to find animals like deer peeling the wood off the cave during winter, making this the prime spot for bigger game. 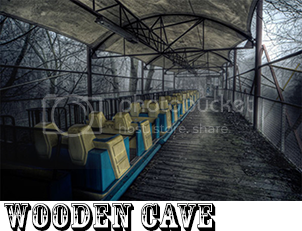 Wooden Hill is connected to Wooden Cave and the two are made from the same materials. 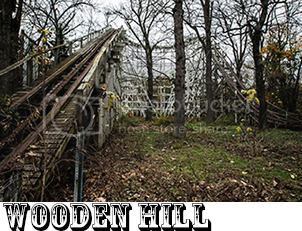 While old, Wooden Hill has actually become stronger as plants grew in and out of the woodwork, making it the tallest structure a creature can safely walk on. The topmost part provides a beautiful view just over the trees, allowing one to see the Stage, Broken Cave, the structure surrounding Silent Lake and even the South Coast and the oceans beyond. However, because of the wooden structure, it is not recommended that those creatures associated with fire go near it unless they have perfect control. Also it is not recommended that anything heavier than a bear attempt to walk along the hill. 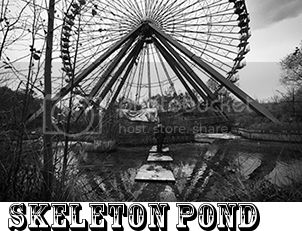 Skeleton Pond is named after the numerous metal skeleton-like structures that litter the waters and the ground around it. While this pond is actually more of a marsh then an actual pond, the rainwater does seem to gather in the shallow indentation in the center of the structures. The ground is sticky and slick, mud and marsh grass are two things this area seems covered in. And because of the all the metal, it is not recommended that any creature drinks the water in the Pond (evidenced by how many animal skeletons and dead animals there are on the banks) as it seems to be poisonous. However, it seems to be a regular occurrence for Performers to dare new members or new Stage Hands to climb across the metal structures in some sort of hazing ritual. 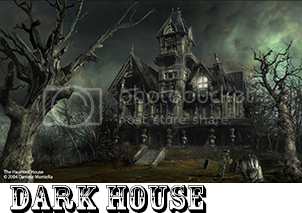 Dark House is an old run down house filled with dark objects like skulls, dead creatures and (strangely) fake things like chains, cobwebs and monsters. There is also a hall of mostly broken mirrors in the house and strange objects that spit smoke if you hit them often enough. Not many creatures willingly enter this house (something about how evil it looks), and many of the darker-aligned Performers make their home here. While there is the strict no-killing rule on the territory, the Dark House reminds creatures that all alignments are welcome. One of the few creeks leading from the ocean empties into a large but shallow lake called Shallow Cove. Rarely (even when it rains) does the water in Shallow Cove get deep enough to reach above an adult wolf’s belly, making it a perfect spot for pups to swim and play. The ship stranded in the middle of the Cove also makes for a fun and safe area for pups to play with little supervision. 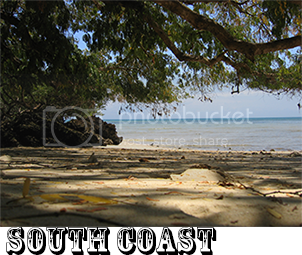 One can follow the shallow trickling creek all the way through the forests to the South Coast. The South Coast of the land bridge is where the forest meets the ocean. Wolves willing to make the two day journey will find themselves on the sandy beaches. Lining the entire South part of the territory, South Coast is a completely flat area where one can see for miles in either direction. It is a perfect place to run along the waters. This is the more dangerous of the two coasts, with higher waves and stronger currents as well stronger winds along the beach. 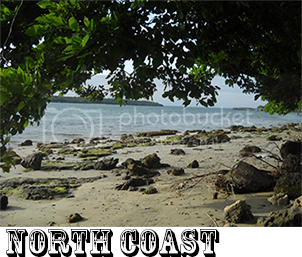 This is also the beach where one can find more sharks then the North Coast, mostly Reef, Bull or sometimes Tiger Sharks. This is also the warmer of the two coasts year round. It takes roughly two days to reach this part of the territory. The North Coast of the land bridge is the colder of the two coasts as well as the one with the most debris. The waves on this coast are slower moving and smaller, but seem to carry far more objects up on to the beach, coating this coast with things like old tree branches, fish skeletons, bird remains, and shells. 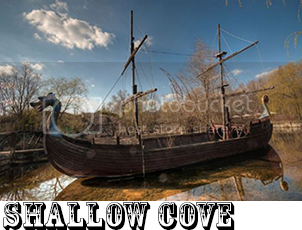 This is the ideal coast for collecting shells and bones as well as occasionally finding shiny treasures. The sand of this coast sparkles with crushed shells and mica fragments, nicknaming this coast “Shining Coast”. The Wild Fields surround the territory. While not all of the field belongs to the Cirque, it is a regular assumption that it does. During the spring and summer months, Wild Fields is full to the brim with hundreds of wild flowers and wild herbs, making it smell very enjoyable. This is also a great place for healers to gather herbs for their practice or for wolves to hunt as there is more game here than anywhere else. 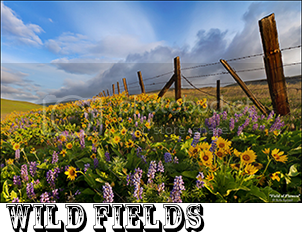 The Wild Fields are roughly a half a day to a day’s journey from the Stage at the center of the land bridge. Just beyond the Fields lay the North Coast, while the forest lines the South Coast. A neutral pack with no limits on anything. Alignment? Any. Species? Whatever you want. The only limit is that if you want a permanent member in this pack you have to be active. And yes, you can have cats, birds, horses, whatever. But the majority of the Cirque is wolves. This pack is run very differently from others you may have encountered. Unlike a resident pack, the Cirque de L'étrange is more like a group living in a territory. The “Grounds” as the residents call it, is rather expansive. The only permanent members are called the “Performers” and the Alpha male is referred to as “The Ringmaster.” Non-permanent members or wolves passing through are called the “Audience” or the “Stage Hands” depending on how often they stay on the Grounds. Completely neutral in every way, the Cirque stays out of wars and arguments, preferring to accept the outsiders from all species and alignments. Having Light Wolves living alongside Dark Wolves is a very common sight at the Grounds, but everyone obeys The Ringmaster. Protecting their territory and those living on it is the Cirque’s only priority. Messing with those on the Grounds can and will get the attention of the Performers and you will most likely end up severely hurt or dead. The alignment of the victim does not matter, the Cirque is neutral ground. No blood is shed on the Grounds. Seeking sanctuary with the Cirque is very much possible, but it is The Ringmaster’s final choice if a person stays or goes. Once within territory lines, all are considered property of the Cirque. The Cirque and its Performers, Stage Hands and Ring Master are responsible for their safety, care and safe passage over the land bridge. Once within territory lines, all are considered without alignment. Grudges, blood feuds, he-said-she-said and the like are to be forgotten. No killing of a Stage Hand, Performer, ect. If any of the territory rules are broken, the Performers, Stage Hands and Ring Master are free to punish the guilty party as they see fit, whether with service or death. Cirque de L'étrange is a true neutral territory. It allows passers of all alignment, be it Dark, Light or Neutral, through the territory as it rests on the land bridge. It also houses those of any alignment for rest and recuperation on their journey, or to hide from family/pack/breed issues. This is a no kill territory (in case that wasn’t clear before). It is considered the HIGHEST offence to kill another on the grounds (with the exception of prey animals like deer, rabbits, squirrels, fish and occasionally bears). However, if the animal in question is officially under the care of the Cirque, they are considered untouchable. Within the territory is the pack rules, which apply to only the Stage Hands, Performers and Ring Master. Stage Hands must stay within the territory no more than 6 times a year and no less than 3 to be considered Stage Hands. Stage Hands have free range of the territory, but cannot stay in the Tents like Performers do. They also are allowed to hunt AFTER the Performers do. Stage Hands are required to obey Performers and assist them in any way they can. Performers are permanent members of the territory. They stay and live on the grounds. Performers obey the words of the Ring Master. What s/he says is law. PLEASE NOTE: The mate(s) of the Ring Master, the offspring of the Ring Master and any relatives of the Ring Master are considered Performers, Stage Hands or Visitors depending on the frequency of their stay. There is only ONE Ring Master. All members of the Cirque put on performances for the Audience using their talents or strange attributes. The Ringmaster decides who performs on a certain night and how a show will go. The Ringmaster is the Alpha, undisputed and absolute. He alone decides who stays on the Grounds and who has to leave. He deals with outsiders more than other members of the Cirque and is responsible for the entire territory’s protection. If he takes a mate, that mate will be a Performer. There is only one Ringmaster. The Performers are the permanent members of the pack and operate somewhat like a close-knit family. Most are strange looking or even different species, but they still operate together as a team. Neutral as a group, individual alignments are as varied as the group. They obey The Ringmaster without question and will not hesitate to defend the Grounds and those on it. Stage Hands are semi-permanent members of the pack that come and go as they like but usually always return. Having no other pack to call their own, the Stage Hands are welcomed home to the Grounds but still have to answer to The Ringmaster about their journeys and what they’ve seen. They also have to listen and help the Performers. The Audience are visitors to the Grounds. As the Grounds is a very open place, many species of sentient animal cross through the territory and are allowed to stay for a little while. Audience members do not stay and often call others packs their homes, but still choose the fun and laid-back atmosphere of the Grounds for vacations. Audience members are to be protected, regardless of alignment, and treated with respect. However, once The Ringmaster says it’s time for you to leave, you’d better leave. This is the one and ONLY True Neutral pack in the Realm. Neither Light nor Dark, the Cirque welcomes all types of alliances on its grounds with the understanding that creatures check their history at the door and abandon their prejudices upon entrance. This is also the only pack that welcomes all sorts of creatures, from prey animal (deer, squirrel, etc) to predator (vampire, Dragulf, etc) and everything in between. Freaks, outcasts, those who are cursed, those who are blessed; all are welcome. The Cirque would welcome both Skeezix and Rainbow Chaser for the same showing (as long as they could stand to be near one another). It should be noted, however, that this pack leans more towards a LAWFUL alignment as it follows the rules of the territory. This means that they can (and will) remove anyone who breaks the rules, be it visitor or the Ring Master. That does NOT mean they don't welcome a little chaos in their ranks, after all, without chaos, what fun would a circus be? And without law, think how quickly those chaotic urges would burn out from too much indulgence. It's all about balance, kids. If an argument should occur within the grounds, the ones participating are either asked to leave or to "fight it out in show" to both get out their energy and work out their argument in a way that will be entertaining to the audience. The founder of Cirque de L'etrange was Danse Macabre, and he is the current Ring Master as well. Among the first Performers Danse brought to his territory were the Tear Siblings, Harikizu, Tobrias, and Shuredda, a group of wolves born with unusual markings and even more unusual lethal deformities to their wings. According to rumor, Danse started the Cirque to create a world without pain and suffering after the death of his mate. He believed that if wolves could set aside their prejudice and hatred, the world would benefit. He then created the rules all creatures passing through must abide by and serves as final judge in whether a creature gets to stay in the area or not. As time went on, more and more creatures passed through, some staying, some choosing to come and go as they like and some choosing to only visit. But whether or not a creature comes for the show, the Cirque sits in a definitive area of the realm. It takes up the ENTIRE land bridge that separates one end of the continent from the other. ALL travel goes through the Cirque land. Because of that Danse created the law that NO blood is to be shed on Cirque Ground and if it is, there will be punishment to pay. What that punishment is no one knows. Being an Eliant Demon, Danse has magic most creatures do NOT want to mess with. And the land itself seems to exhume a magic that may or may not come in to effect if the rule is broken. The Tear Siblings are introduced and meet Danse for the first time. He recruits them and brings them home to the Cirque grounds. Several months have passed and the siblings have grown fond of their home, and a newcomer arrives in flame and fire, introducing Gravitation the Fire Drake.